Boston Terrier Gifts has Boston Terrier dog stationary. Write to your friends on special Boston Terrier dog stationery. Boston Terrier Gifts has unique Boston Terrier stationery including Boston Terrier memopads, boston terrier notepaper cubes and a memo holder. Send personalization information when checking out in special instructions. Click on the picture of each Boston Terrier stationery item for a larger image of that particular item. Our Boston might look a little serious...but she's just planning her next bounce...as Bostons do you know! Great for ALL occassions! Comes in a pack of 10 blank greeting cards with print by Keri Lyn Studios on front. Perfect for correspondance for birthdays or any occassion. Printed on high quality paper. You will be so pleased with this high quality stationary you will be coming back for more! What a great way to show your holiday spirit...with this fun little Boston Terrier Dog just hanging out for the Holidays! A fun and unique design for any dog lover ~ makes a great holiday card too! Perfect for correspondence for any occasion. Printed on high quality paper. You will be so pleased with this high quality stationary you will be coming back for more! Let your Boston pooch hold your notes with the Boston Terrier with Puppy Note Holder! Use as a refrigerator magnet or on a desk. Goods for the home, school or office. 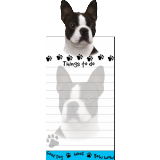 The Boston Terrier Family Magnetic Note Holder is ideal for shopping lists, messages or reminders. With a strong magnet on the back, the hold-a-note adheres to refrigerators, filing cabinets or any steel surface. Has a full size magnet on the back. Easy to refill with more paper when needed, use it over and over again. Approximate size of the hold-a-note, with paper, is 4" x 5" x 1". 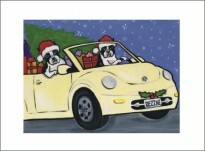 This Crusing Boston Terrier in a VW Bug Christmas Card will brighten your holidays. Great Christmas greeting! Lovely print by Keri Lyn Studios on front. Printed on high quality paper. You will be so pleased with this high quality stationary you will be coming back for more! Boston Terrier Sitting note cards are great for all occasions. 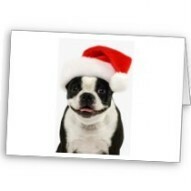 Comes in a pack of 6 blank note cards with an adorable Boston Terrier dog on the front. Perfect for correspondence for any occasion. Printed on high quality paper. You will be so pleased with this high quality stationary you will be coming back for more! This fine hand-painted resin Boston Terrier Pencil Cup is great for home or office. Dog paw prints adorn a beige colored cup that will hold your pens and pencils with the Boston Terrier peaking out of the cup holding on with their paws. Measures 6"H x 4"W An excellent gift for the Boston Terrier dog lover. Boston Face Note cards are great for all occasions. Comes in a pack of 10 blank greeting cards with print by Keri Lyn Studios on front. Perfect for correspondence for any occasion. Printed on high quality paper. You will be so pleased with this high quality stationary you will be coming back for more! A Classic greeting card featuring the Boston Terrier Dog. The baroque Boston Terrier Card has a striking picture of a boston Terrier Dog surrounded by Baroque filigree in black and white with a rose red section uderneat that says "greetings". Card is blank inside. You can have the word 'greetings removed if you'e like and replace it with your own word(s) or leave blank. Just write us at linda@bostonterriergifts.com with instructions. Charming and cute Boston Terrier Lovers will adore it. Printed on ultra-heavyweight (120 lb.) card stock with a gloss finish. Size: 5.6" x 4" Each card comes with a white envelope. 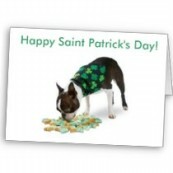 For a special St. Patrick's Day Greeting choose this delightful Boston Terrier Saint Patrick's Day Greeting Card. A great way to share the luck of the Irish! This charming Boston Terrier Dog whose name is Spanky makes the perfect Uncle Sam in his special patriotic outfit. The perfect Boston Terrier greeting card for the 4th of July or Memorial Day for Boston Terrier lovers and all dog lovers! Greeting Card Size - Vertical: 5" x 7"
Ultra-heavyweight (120#) card stock with a gloss finish. Printed with a unique process that imparts a rich depth of imagery and an almost 3D-like effect. Each card comes with a matching envelope. Boston Terrier-Fur Children Blank Notes have a lovely detailed picture of the Boston Terrier on the outside and are blank inside to write your own personalized note to your friend. These cards come eight to a box with envelopes and stickers featuring the same image to seal each message. Perfect for correspondence for any occasion. The Boston Happy Birthday to You Card features am artist's view of her Boston Terrier Dog. Make a delightful birthday card for your Boston Terrier loving friend. Plain on the inside - you can write your own greeting. Printed on ultra-heavyweight (120 lb.) card stock with a gloss finish. Size: 5" x 7" Each card comes with a white envelope. The Boston Terrier Dog Surrounded in Color Card is a great note card for special greeting from and to Boston Terrier Dog Lovers! Charming and cute Boston Terrier Lovers will adore it. Printed on ultra-heavyweight (120 lb.) card stock with a gloss finish. Size: 5.6" x 4" Each card comes with a white envelope. 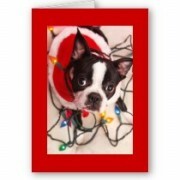 Boston Terrier-Fur Children Happy Holidays Blank Note cards s have a lovely detailed picture of the Boston Terrier with a Santa Hat on the outside and are blank inside to write your own personalized note to your friend. These cards come eight to a box with envelopes and stickers featuring the same image to seal each message. Perfect for correspondance for any occasion. Boston Puppy Fur Children Blank Notes have a lovely detailed picture of the Boston Terrier on the outside and are blank inside to write your own personalized note to your friend. These cards come eight to a box with envelopes and stickers featuring the same image to seal each message. Perfect for correspondence for any occasion. This charming Happy Birthday Boston Terrier Card shows a happy Boston Terrier enjoying his special birthday. Great birthday card for Boston Terrier Dog Lovers! Charming and cute Boston Terrier Lovers will adore it. Printed on ultra-heavyweight (120 lb.) card stock with a gloss finish. Size: 5.6" x 4" Each card comes with a white envelope.